"Katoppo’s novels tell the story of independent women restrained by conservative men." Writer and world-renowned feminist theologian Marianne Katoppo maintained that theology was rooted in language. Asymptote Indonesia Editor-at-Large and poet Norman Erikson Pasaribu makes the case that with her writing, Katoppo also challenged and defied the systemic injustices of Indonesian society that were inherent in language, too. Enjoy Norman’s beautiful essay in English and scroll down to read it in the original Indonesian. The illustration is clear: a frog that never surpasses the boundaries of a coconut shell will only view the world as a dark, quiet, and limited place. If anyone were to tell it that there’s another world: a colorful and bright place, with music and an open natural landscape, this frog will say it’s a lie. “After all, language is where theology begins,” Marianne Katoppo writes in her revolutionary book, Compassionate and Free: An Asian Woman’s Theology (1979). She then presents an argument about how sexism and patriarchy in the church are rooted in language. She says that in Hebrew, the Holy Spirit Ruakh is feminine, which evolved into Pneuma, a gender-neutral form in Greek by the Septuaginta translator, and then changed into the masculine in Latin. “Therefore, the Trinity we have now is entirely male,” Katoppo concludes. Indonesia is a nation where people’s lives are strongly driven by religion. This is clear even in the first principle of Pancasila, the Indonesian state’s foundational philosophy: “Believe in the one Supreme God.” Thus, although the Indonesian language does not have the concept of gender in its grammar, it is unsurprising that the country’s religious institutions—which have been long dominated by men—have also contributed to an unfair system of privileges. Religious institutions often become the first barrier that “the other” has to face in order to be a whole individual. Marianne Katoppo’s life was a constant battle against such oppressive structures. Born in 1943, Katoppo was raised in a family with feminist values. Her father was the minister of education of the short-lived State of East Indonesia (1946—1950), and he upheld gender equality among all of his ten children. Katoppo pursued her theological education at the Jakarta Theological Seminary before leaving Indonesia and continuing her theological studies in Switzerland, Japan, England, Korea, and Germany while also studying languages. Later, she continued to explore the edges of the world to teach feminist theology. Katoppo’s interest in theology was entwined with her passion for languages. She published her first short story at the age of eight. Besides her seminal work, Compassionate and Free: An Asian Woman’s Theology, Katoppo also published five novels: Dunia Tak Bermusim (A World with No Season, 1974), Raumanen (1977), Anggrek Tak Pernah Berdusta (The Orchid Never Lies, 1977), Terbangnya Punai (The Green Pigeon Flies Away, 1978), Rumah di Atas Jembatan (The House on the Bridge, 1981). She won the prestigious Jakarta Arts Council Novel Competition in 1975 for Raumanen and became the first woman to win the SEA Write Award in 1982. Fluent in twelve languages, she translated Knut Hamsun, Nawal El Saadawi, and Elie Wiesel into Indonesian—all of which were published by Obor, a Catholic publishing house in Jakarta. Given the enormity of her achievements, I—born and raised in Indonesia—seriously believe that no Indonesian man has matched Katoppo’s accomplishments. Compassionate was written in English and published by the World Council of Churches, Switzerland. The book was translated into Dutch, German, Swedish, Tagalog, and was used as teaching material for Christian theology for Asian women in theological schools around the world. However, it was only after 28 years that her brother Pericles Katoppo published the Indonesian translation of the book—on April 2007, to be exact. In October of the same year, Marianne Katoppo passed away. In the last few years, we have started to see the rise of a movement to rediscover overlooked and forgotten women writers such as Lucia Berlin or Bette Howland, and Katoppo is one such example for Indonesia. Katoppo’s feminist theology is a perfect response to the increasing demonization of women carried out by religious leaders that Indonesians have encountered in the recent past. Unfortunately, Marianne Katoppo has been altogether erased from Indonesia’s history. In the introduction to the Indonesian translation of Compassionate, Katoppo stated that her name and her books would not be found in the theology curriculum in Indonesia, not even at her alma mater, and she was right. Her literary works are no longer widely read—all of them are out-of-print—and the last reprint of Raumanen was by Metafor Publishing in 2006, a year before her death. This is a grave turn of events because Katoppo’s novels tell the story of independent women restrained by conservative men through adat law (traditional code of law of the indigenous people), social expectations, or religion. In Dunia Tanpa Musim and Raumanen we meet Anitra and Raumanen, free women who should be able to make their own life choices, but are prevented from doing so by their male lovers, who live shackled with adat and religious constraints. “Where were you last night?” Martin asked for the third time. Apparently, he really wanted to know. In short, the postpartum blindness in Raumanen is a symbol of women losing their earlier way of life after becoming a mother. It denotes the limits of the Indonesian woman’s freedom. She is defined by her domestic roles—either a wife or a mother—that are warped by patriarchy. It is difficult to find the poor in churches. Many Indonesians throughout their lives never wear shoes, a common habit in warm-climate countries (Jesus and his disciples wore sandals). […] Many Christians—faithful to the commands of the missionaries during the Victorian era even after so many years passed by—felt that they needed to dress up before entering the church, hence wearing shoes become obligatory. My older female relative told me that before the War [World War II], women would have to wear long socks, gloves, and a hat. In the tropical warm weather, the suffering of Christians must be very high. Now, almost 20 years after the revolution, almost two decades after the people of this nation have lived their lives as “Indonesians,” unfortunately the burden of prejudice on other ethnic groups cannot be forsaken so easily. “What ethnic group do you belong to?” and “Who are your parents?” are still the first lines that decorate introductions. And even if these aren’t said, often a sideway glance means more than a thousand words. An important aspect to remember about Marianne Katoppo is that since 1978, when referring to a female, Katoppo consistently used the Indonesian term perempuan instead of wanita. * This is interesting because during the Suharto years of the “New Order” (1966—1998), the word perempuan had a pejorative connotation and most people used wanita. Katoppo explains her choice in the introduction to the Indonesian version of Compassionate. She says that the word perempuan is rooted in the word mpu, which means wisdom, power, and charisma, whereas wanita denotes “she who is showered with praise by the whole world.” It is clear that for Katoppo, the word perempuan has an unapologetic character that allows women to be complete individuals who are under no obligation to satisfy or please the world. Katoppo’s revolution for women’s position in the church and the secular world thus began with language itself. 1) The author would like to thank Dewi Kharisma Michellia for providing Katoppo’s books from the library of Driyarkara School of Philosophy. 2) The excerpts from Compassionate and Free: An Asian Woman’s Theology in this piece are translations from the Indonesian translation of the book. I had to do this since the original English version of the book is out-of-print and hard to find. *“Marianne Katoppo: Yang Hampir Terlupakan dari Sastra Indonesia,” Redaksi Jurnal Perempuan. Norman Erikson Pasaribu is the author of Sergius Mencari Bacchus (Sergius Seeks Bacchus), a collection of poetry that tells the lives of queer individuals in urban Indonesia. Dubbed by the English PEN as “part of long tradition of queer Catholic writing,” the book won first prize in the 2015 Jakarta Arts Council Poetry Manuscript Competition and a finalist of Khatulistiwa Literary Award for Poetry. Norman is one of the Asymptote’s Editors-at-Large, covering Indonesia. Shaffira Gayatri completed her postgraduate degree in World Literature at University of Warwick, UK and is currently a researcher at Women Research Institute, an Indonesian NGO based in Jakarta. She is a part-time translator and teacher, and enjoys traveling, reading, and hiking in her free time. Gambarannya jelas: katak yang tidak pernah melewati batas-batas tempurung kelapa, hanya memahami dunia sebagai sesuatu yang gelap, sunyi, dan terbatas. Katak ini akan menganggapnya sebagai kebohongan kalau dikatakan kepadanya bahwa ada dunia yang lain: dunia yang penuh cahaya dan warna, musik dan alam yang terbuka luas. “Bagaimanapun juga, bahasa adalah di mana teologi dimulai,” tulis Marianne Katoppo pada bukunya yang revolusioner, Compassionate and Free: An Asian Woman’s Theology (1979). Selanjutnya ia mengutarakan argumen mengenai salah satu akar seksisme dan struktur patriarkal pada Gereja dan ajarannya: bahwa dalam bahasa Ibrani Roh Kudus berbentuk feminin (Ruakh) dan diubah menjadi netral (Pneuma) oleh penerjemah Septuaginta bahasa Yunani, dan menjadi maskulin dalam bahasa Latin. “Oleh sebab itu kita sekarang mempunyai suatu Trinitas yang seluruhnya laki-laki,” ia menarik kesimpulan. Indonesia adalah bangsa yang kemudi kehidupannya dicengkeram erat oleh agama. Ini tampak jelas sudah sejak dalam sila pertama ideologi bangsa Indonesia Pancasila: Ketuhanan yang maha esa. Sehingga, sekalipun bahasa Indonesia tidak mengenal gender dalam gramatikanya, tak mengejutkan bahwa institusi agama—yang sejak lama telah didominasi laki-laki—juga ikut menimbulkan suatu sistem hak istimewa tak adil dan tak jarang menjadi dinding pertama bagi seseorang yang liyan untuk menjadi individu yang utuh. Hidup Marianne Katoppo adalah perjuangan melawan struktur yang opresif itu. Lahir pada 1943, Marianne dibesarkan pada sebuah keluarga dengan nilai-nilai feminis. Ayahnya pernah menjadi menteri pendidikan untuk Negara Indonesia Timur yang berumur pendek (1946-1950), dan menerapkan kesetaraan gender kepada sepuluh anaknya. Marianne menempuh pendidikan teologinya di Sekolah Tinggi Teologia di Jakarta, sebelum kemudian pergi ke Swiss, Jepang, Inggris, Korea, dan Jerman untuk belajar bahasa dan meneruskan pendidikan teologinya. Setelah itu ia terus pergi ke berbagai sudut dunia untuk mengajar kuliah teologi feminis. Minatnya kepada teologi melahirkan kecintaannya kepada bahasa, atau bisa juga sebaliknya—segalanya mungkin. Ia menerbitkan cerita pendek sejak umur delapan tahun. Selain Compassionate, Katoppo menerbitkan lima novel: Dunia Tak Bermusim (1974), Raumanen (1977), Anggrek Tak Pernah Berdusta (1977), Terbangnya Punai (1978), Rumah di Atas Jembatan (1981). 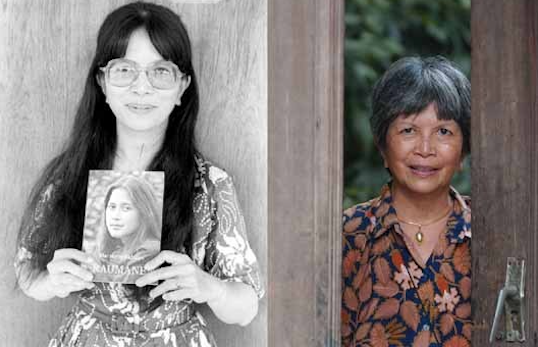 Ia memenangkan Sayembara Menulis Novel Dewan Kesenian Jakarta 1975 yang prestisius dan menjadi perempuan pertama yang meraih SEA Write Award pada 1982. Ia juga fasih dalam 12 bahasa, dan menerjemahkan Knut Hamsun, Nawal El Saadawi, Elie Wiesel dari bahasa aslinya—semuanya terbit melalui Obor, sebuah penerbit Katolik di Jakarta. Melihat pencapaiannya, saya—lahir dan besar di Indonesia—tak yakin apakah ada lelaki Indonesia yang pernah melakukan hal-hal sebesar dan seberagam Marianne. Compassionate ditulis dalam bahasa Inggris dan terbit pada 1979 (World Council of Churches, Switzerland). Buku itu kemudian diterjemahkan ke dalam bahasa Belanda, Jerman, Swedia, Tagalog, dan dipakai sebagai bahan ajar mengenai teologi Kristen perempuan Asia di berbagai sekolah teologi di dunia. Namun, baru 28 tahun kemudian terbit dalam terjemahan bahasa Indonesia oleh Pericles Katoppo—tepatnya pada April 2007. Pada Oktober tahun yang sama, Marianne Katoppo meninggal. Beberapa tahun terakhir kita mulai melihat naiknya gerakan membaca kembali penulis-penulis perempuan yang terlewatkan dan terlupakan—misalnya Lucia Berlin atau Bette Howland—dan Katoppo adalah salah satu nama penting untuk ditekuni kembali oleh bangsa Indonesia hari ini. Teologi feminis Katoppo adalah salah satu jawaban dari demonisasi perempuan oleh pemuka agama, yang kian banyak kita temui belakangan ini. Ketimbang terlewatkan dan terlupakan, Katoppo adalah perempuan yang telah dihapus dari sejarah. Pada pengantar terjemahan Indonesia Compassionate, Katoppo mengungkapkan bahwa nama dan bukunya tak akan bisa ditemukan di silabus pengajaran teologi di Indonesia, termasuk pada almameternya sendiri. Karya-karya sastranya juga tak lagi dibaca secara umum—seluruhnya tak lagi bisa ditemukan di toko buku besar—cetak-ulang terakhir adalah Raumanen pada 2006, setahun sebelum Katoppo meninggal, oleh penerbit Metafor. Padahal, novel-novelnya mengisahkan perempuan-perempuan bebas yang teralienasi karena laki-laki yang terpenjara—baik oleh hukum adat, ekspektasi sosial, maupun agama. Pada Dunia Tanpa Musim dan Raumanen kita bisa menemukan Anitra dan Raumanen yang bebas, yang sebetulnya bisa menentukan pilihan kehidupannya, tetapi kemudian terbatasi oleh pasangan lelaki mereka, yang hidup dalam kungkungan adat dan agama. “Di mana kau semalam?” tanya Martin untuk ketiga kalinya. Rupanya ia betul-betul ingin tahu. Di sisi lain, Raumanen dapat kita bandingkan dengan The Bell Jar Sylvia Plath. Keduanya bicara mengenai perempuan muda yang dihadapkan dengan isu-isu sensitif bagi perempuan pada masanya, kehamilan dan pernikahan dengan lelaki yang tak tepat. Meskipun begitu Raumanen berbeda dari Esther—Raumanen adalah mahasiswi muda Kristen yang aktif di organisasi kekristenan di kampusnya, yang kemudian hamil oleh Monang. Secara ringkas, kebutaan paska-melahirkan dalam Raumanen adalah simbol perempuan yang terpaksa meninggalkan jalan hidup dan identitasnya setelah menjadi ibu. Ini menggambarkan kian terbatasnya ruang gerak perempuan di Indonesia setelah ia dilekatkan dengan peran-peran domestik—misalnya ibu atau istri—yang sudah belok maknanya karena patriarki. Sulit mencari kaum miskin di gereja-gereja. … Banyak orang Indonesia sepanjang hidupnya tidak pernah memakai sepatu, suatu kebiasaan yang umum di negara-negara beriklim panas (Yesus dan murid-muridnya rupanya memakai sandal). … Banyak orang Kristen – setelah bertahun-tahun berlalu masih tetap setia pada perintah para misionaris zaman Victoria – merasa bahwa “kita harus berpakaian pantas” bila masuk gereja, tentu orang harus memakai sepatu. Kerabat perempuan saya yang lebih tua menceritakan bahwa sebelum Perang (PD II), kaum perempuan harus memakai kaos kaki panjang, sarung tangan dan topi. Di bawah udara panas daerah tropis mutu penderitaan orang Kristen pasti sangat tinggi. … Sekarang, hampir 20 tahun sesudah Revolusi, sesudah dua windu lebih penduduk Nusantara berpengalaman hidup sebagai “orang Indonesia”, ternyata beban prasangka serta wasangka terhadap suku lain masih belum dapat dilepaskan orang dengan begitu mudah. ”Orang mana?” dan “Anak siapa?” masih jadi nada pertama suatu perkenalan baru. Dan kalaupun tak sampai terucapkan, seringkali kerlingan mata lebih berarti daripada seribu kata. Revolusi Katoppo untuk posisi perempuan dalam gereja dan dunia sekuler pun dimulai dari bahasa. Catatan: Saya mengucapkan terima kasih kepada Dewi Kharisma Michellia yang telah menyediakan buku-buku Marianne dari perpustakaan Sekolah Tinggi Filsafat Driyarkara. Norman Erikson Pasaribu menerbitkan Sergius Mencari Bacchus (Gramedia Pustaka Utama, 2016), pemenang pertama Sayembara Manuskrip Buku Puisi Dewan Kesenian Jakarta 2015. Ia salah satu Editor-at-Large Asymptote untuk wilayah Indonesia. Shaffira Gayatri menyelesaikan gelar masternya dari Universitas Warwick dan sekarang bekerja untuk Women Research Institute, sebuah NGO di Jakarta. Ia mengajar dan menerjemah di waktu luangnya. Ia gemar jalan-jalan, membaca, dan memanjat gunung.